Using flush-cutters, cut the loop off the top of one silver-plated 23x23mm fancy flower drop and three silver-plated 19x18mm sunflower drops. Place a thin layer of adhesive in the center of a 31mm pink acrylic flower. Press five 15x4mm marquise white enamel drops into the epoxy between the petals of the flower. Place a thin layer of adhesive on the back of the silver-plated 23x23mm fancy flower drop and set it in the center of the 31mm pink acrylic flower on top of the enamel drops. Using the adhesive, attach one 7.2mm light topaz flat back crystal in the center of the silver-plated 23x23mm fancy flower drop and four 3.1mm smoky topaz chatons in the four round settings along the edge of the silver-plated 23x23mm fancy flower drop. Let the adhesive set for 24 hours. Place a thin layer of adhesive in the center on the back of a 31mm teal acrylic flower. Attach one 24x10mm light teal enamel drop and one 24x10mm dark teal enamel drop at 45 degrees from each other and then one silver-plated 14.5x14.5mm flower drop (the back of the drop to the outside) over the enamel drops. On the front of the flower, press three 3/4 inch ballpins into the epoxy between each petal of the flower, for a total of 15 ballpins. Place a thin layer of adhesive on the back of a silver-plated 19x18mm sunflower drop and set it in the center of the 31mm teal acrylic flower on top of the ballpins. Using the adhesive, attach one 7.2mm crystal AB flat back crystal in the center of the silver-plated 19x18mm sunflower drop and one 3.9mm light Siam flat back crystal in the center of the 7.2mm crystal AB flat back crystal. 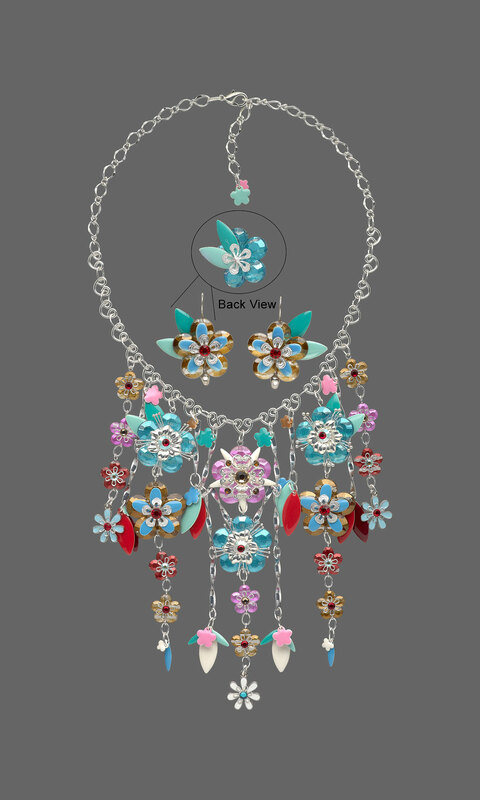 Make sure the hole of the flower bead is aligned vertically, and create the second double-sided 31mm teal acrylic flower in a mirror image of the first. Place a thin layer of adhesive in the center of a 31mm teal acrylic flower. Press three ballpins into the epoxy between each petal of the flower for a total of 15 ballpins. Place a thin layer of adhesive on the back of the silver-plated 19x18mm sunflower drop and set it in the center of the 31mm teal acrylic flower on top of the ballpins. Using the adhesive, attach one 7.2mm crystal AB flat back crystal in the center of the silver-plated 19x18mm sunflower drop and one 3.9mm light Siam flat back crystal in the center of the 7.2mm crystal AB flat back crystal. Place a thin layer of adhesive in the center of a 31mm brown acrylic flower. Press five 10x6mm oval turquoise blue enamel drops into the epoxy, one on each petal of the flower. Place a thin layer of adhesive on the back of the silver-plated 14.5x14.5mm flower drop and set it in the center of the 31mm brown acrylic flower on top of the enamel drops. Using the adhesive, attach one 3.9mm light Siam chaton crystal in the center of the silver-plated 14.5x14.5mm flower drop. Flatten a silver-plated 7mm flower bead cap. Place a thin layer of adhesive in the center of a 15mm pink acrylic flower. Press the flattened bead cap into the center of the flower. Using the adhesive, attach one 3.9mm light topaz flat back crystal in the center of the silver-plated 7mm flower bead cap. Flatten a silver-plated 7mm flower bead cap. Place a thin layer of adhesive in the center of a 15mm red acrylic flower. Press the flattened bead cap into the center of the flower. Using the adhesive, attach one 3.9mm crystal AB flat back crystal in the center of the silver-plated 7mm flower bead cap. Flatten a silver-plated 7mm flower bead cap. Place a thin layer of adhesive in the center of a 15mm brown acrylic flower. Press the flattened bead cap into the center of the flower. Using the adhesive, attach one 3.9mm light Siam flat back crystal in the center of the silver-plated 7mm flower bead cap. Two 17x17mm light blue enamel flower charms: Flatten a silver-plated 7mm flower bead cap. Place a thin layer of adhesive in the center of a 17x17mm light blue enamel flower charm. Press the flattened bead cap into the center of the flower. Using the adhesive, attach one 3.9mm light Siam flat back crystal in the center of the silver-plated 7mm flower bead cap. One 17x17mm white enamel flower charm: Flatten a silver-plated 7mm flower bead cap. Place a thin layer of adhesive in the center of a 17x17mm flower white enamel charm. Press the flattened bead cap into the center of the flower. Using the adhesive, attach one 3.9mm blue zircon flat back crystal in the center of the silver-plated 7mm flower bead cap. String the 31mm pink acrylic flower onto a 3-inch eyepin. Using a pair of chain-nose pliers, round-nose pliers and flush-cutters, form a simple loop on the straight end of the wire, creating a 31mm pink acrylic flower link. Repeat to attach an eyepin to each of the acrylic flowers created in Steps 2 and 3. Using flush-cutters, cut one 4-inch length and one 5-1/2inch length of silver-plated 9x6mm Figaro chain. Using a pair of chain-nose pliers and flat-nose pliers, open an 8x6mm jumpring. Pass it through the loop on the lobster claw clasp and the first link of the 4-inch length of chain. Close the jumpring. Repeat to attach a second 8x6mm jumpring next to the first, creating a double jumpring. Continue to connect nineteen sets of one 8x6mm jumpring and one silver-plated 10x9mm pretzel-shaped link to the last link on the 4-inch length of chain. Open an 8x6mm jumpring. Pass it through the first link on the 5-1/2 inch length of chain and the last silver-plated 10x9mm pretzel-shaped link. Close the jumpring. Open an 8x6mm jumpring. Pass it through the last link on the 5-1/2 inch length of chain and the hole on both a pink 6mm flower drop and a light blue 10mm flower drop. Close the jumpring. Open an 8x6mm jumpring. Pass it through the jumpring between the first and second silver-plated 30x3mm twisted links attached to the ninth silver-plated 10x9mm pretzel-shaped link and to one silver-plated 30x3mm twisted link. Close the jumpring. Continue to attach two 8x6mm jumprings and another silver-plated 30x3mm twisted link. Add one more 8x6mm jumpring and also attach it to the jumpring between the first and second silver-plated 30x3mm twisted link attached to the eleventh silver-plated 10x9mm pretzel-shaped link. Place a thin layer of adhesive in the center on the back of a 31mm brown acrylic flower. Attach one 24x10mm light teal enamel drop and one 24x10mm dark teal enamel drop at 45 degrees from each other and then one silver-plated 14.5x14.5mm flower drop (the back of the drop to the outside) over the enamel drops. Make sure the hole of the flower bead is aligned vertically. Place a thin layer of adhesive in the center on the front of the flower. Press five 10x6mm oval turquoise blue enamel drops into the adhesive, one on each of the petals of the flower. Place a thin layer of adhesive on the back of a silver-plated 14.5x14.5mm flower drop and set it in the center of the flower on top of the enamel drops. Using the adhesive, attach one 3.9mm light Siam chaton crystal in the center of the silver-plated 14.5x14.5mm flower drop. Repeat to create a second 31mm brown acrylic flower drop in a mirror image of the first. Let the adhesive set for 24 hours. String one of the assembled flowers onto a heart-shaped headpin. Using round-nose pliers and chain-nose pliers, form the end of the wire into a fishhook earwire. Repeat Step 2 to create the second earring.